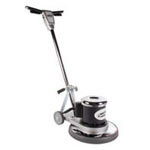 An all steel body & chassis construction guarantees a durable & long lasting floor buffer. Heavy-duty 66 style frame w/ 1.5 HP motor & all steel triple planetary transmission allows this machine to buff, scrub & strip hard floors as well as scrub carpets. Safety lock-out switch is a safety measure to prevent accidental start up. 50' safety yellow power cord for extended reach in any area. Backed by a 5 year warranty on the power train & 1 year on wear items. Great machine at a great price. Review by Patrick B. We use the machine in an industrial environment around corrosive chemicals. The machine is used 7 hours a day, 6 days a week nonstop. The last one lasted over a year, which is really great in these conditions. Most other machines that we have tried in the past would only last around 4 months. [...]the price of the equipment was great and they gave us a free gift too. The next time I have to order more machines, I will place an order with this company. This buffer is great! I love it because it gets the job done. Unlike other expensive shampoors! I recommend this to anybody! I've owned a carpet cleaning business and have been buffing floors for about 25 years. This is a very solid, well performing, product with almost no shortcomings, particularly when price is considered. This a great machine for the price. It was easy to assemble and with the two speed option we're basically getting two machines in one. Definitely A Great Buy!